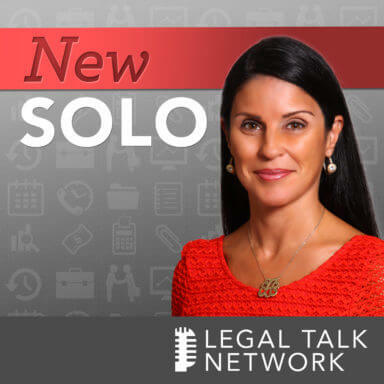 In this episode of New Solo, Adriana Linares talks with Adams and Reese LLP Partner Jeff Richardson about publishing his blog “iPhone J.D.” and his tip for lawyers using Apple mobile products. Jeff opens the interview with a brief history of his occupational past and talks about his New Orleans upbringing. He states that his law practice focuses on class action and complex litigation typically representing defendants when they are sued and that half of his work is appellate practice for all sorts of clients. His firm operated on both Macs and PCs at one time but decided to become a PC-only firm in the early 2000s. As a long time Mac user in both his personal and professional life, Jeff started his blog in 2008, focusing on discussing the different ways attorneys can use Apple mobile technology in their law practices and firms. He notes that all tech today is complicated and emphasizes how learning the little things about a device can make people both happy and productive. Jeff covers the top 3 questions lawyers ask him about Apple mobile platforms and goes in depth on the importance of choosing the right size of product for your everyday legal needs. He closes the interview with his list of the 6 apps that lawyers can’t live without and a few examples of how he uses mobile devices in the courtroom. Jeff Richardson focuses on class action and complex litigation, but also devotes a large portion of his practice to appellate litigation. He has defended numerous clients in high-stakes product liability litigation and publishes “iPhone J.D.,” a website for attorneys who use iPhones and iPads that has been named to the ABA Journal Blawg Hall of Fame. Jeff received his J.D. with high honors from Georgetown University Law Center in 1994, and earned his B.A. with highest honors from Emory University in 1991. Special thanks to our sponsors, Solo Practice University and Clio. Intro: So you are an attorney and you’ve decided to go out on your own. Now what? You need to plan and you are not alone. Join expert host Adriana Linares and her distinguished guests on ‘New Solo’. Tune into the lively conversation as they share insights and information about how to successfully run your law firm, here, on Legal Talk Network. Adriana Linares: Hello, welcome to ‘New Solo’ on Legal Talk Network. I am Adriana Linares, a legal technology trainer and consultant. I help lawyers and law firms use technology better. Before we introduce today’s topic we’d like to thank our sponsors Solo Practice University and Clio. Clio is the world’s leading cloud-based legal practice management software. Thousands of lawyers and legal professionals trust Clio to help grow and simplify their practices. Make sure to learn more about them at HYPERLINK “http://www.clio.com” clio.com. Of course, Solo Practice University is a great resource for Solo’s old and new to learn more about running their practices better. So I want to make sure and introduce our guest before I just start launching into questions and asking him, because I have a bunch of questions for him. Jeff Richardson is here. Actually I am at Jeff Richardson’s office. Thanks for having me, Jeff. Jeff Richardson: Yes we are. Oh, thanks young lady, having you here we have a lovely view of the Mississippi River from 46 floors high in the sky right now. Adriana Linares: Yeah, this is an awesome view. I love looking down on New Orleans, it’s just very cool. I can see my apartment from here. Jeff Richardson: Oh that’s cool. Yeah, my house is in that direction too. Adriana Linares: Oh is it? I rode my scooter here but I could have very easily taken the street car. Jeff Richardson: There you go. Adriana Linares: I just didn’t know, I don’t know. It’s fun to scooter around too. So Jeff, you are lawyer in New Orleans? Jeff Richardson: I am, yes. Adriana Linares: And tell us a little bit about yourself and were you born and raised in New Orleans? Jeff Richardson: Yeah, I was born and raised in New Orleans, went to college in Atlanta at Emory Law School up in Washington, DC at Georgetown and then came back home. I started practicing here in 1994 with Adams and Reese, which is where we are right now. Adams and Reese is not a solo law firm. Jeff Richardson: Let me make that clear, but what I do here is mostly work on Class-Action and Complex Litigation typically representing defendants when they are sued. Maybe about half of my practice nowadays is appellate practice for all sorts of clients on all sorts of issues and I really love drafting appeals and arguing appeals and stuff like that. So that is my law practice, but additionally, ever since 2000 and — oh, I guess it was 2008. Yeah, 2008, I started publishing a blog called HYPERLINK “http://www.iphonejd.com” iphonejd.com where I discuss all of the things that attorneys whether they are solos or if they are in the smallest firms or biggest firms, all of the different ways that attorneys can use Apple mobile technology, iPhones, iPads, now the Apple Watch, to be more productive and have more fun in their law practice. Adriana Linares: And are you a Mac user living in a PC world here at Adams and Reese? Jeff Richardson: — which was completely unusual for a large law firm. There were very few at the time. Arnold & Porter in DC was a big law firm that used Macs, we were, there were a few more, and then even though Steve Jobs came back to Apple in the ’90s there was just so little vertical software for attorneys that had just got to the point where an argument was made that it did not make sense anymore. Jeff Richardson: — but around 2000 our firm became both PCs and Macs, and then a few years after that became PC-only. And so, for over a decade now I’ve used a PC in my office, but at home I have always been a Mac user ever since I bought a — gosh, I guess my first Mac was a Mac Plus that I bought in college with money that I had earned over the summer. So I’ve been using Macs, I have been using Apple products since the Apple II in the late ’70s, but I have been using Macs since the mid-80s and I still love Macs even though I have to use a PC at work because that’s the way it works. Adriana Linares: Yeah. Well I am. I always joke around and call my myself a by, a by-tech, because I definitely have my Mac today and I feel I am about 80% on my Mac as I can be on a PC, but I love them all and I love any technology. Jeff Richardson: Yeah, as long as it can help you. One of the things I love about the mobile tech from Apple specifically is, I’ve always loved the ease-of-use and both, the ease-of-use and power that Apple technology has always given you and there are no blue screens of death or critical things like that, there are always some things you can do in a PC not a Mac. It was always the right balance for me, and so when we became PC-only here at my firm, I was a little disappointed by that and then when the iPhone comes around or when I started using one in 2008 and now the iPad and everything else, it’s sort of the best of all worlds, because I have the PC on my desk when I need to just use Microsoft Word to draft a brief, that’s fine, but the fun tech, you know what, I am using out and about and around my iPhone and my iPad which are in front of me right now, those are the Apple products, and so, little that I know when they took all of our Macs away 15 years ago that there will be a day when I would be happily using Apple technology in the firm. Adriana Linares: I love that. Okay, so let’s talk a little bit about – let’s start small. Adriana Linares: No, let’s start mid-size. Adriana Linares: Let’s go with the iPhone. So I am an iPhone user too. Although I did just get an Android as my backup phone just to have, again, as a techie, who doesn’t want to make sure they understand how to use all the different technologies. But, when it comes to the iPhone, what are the top two or three questions that lawyers ask you about iPhones or maybe leave messages on your blog? Jeff Richardson: Yeah, two types of questions. One type of question that you always get is what are the latest apps that I should use and stuff like that. Adriana Linares: And you are an app-junkie like I get the BGR 11 apps that are free today, every day, and I never pass up at least one of their free apps. Jeff Richardson: I have tried to cut back, and even so, I have how many screens are there on an iPhone screen? 12 screens, and now that we have folders, you can have even more than. I have so many apps in my iPhone that it is ridiculous and I should just go through and delete them but I feel like they are my kids. Adriana Linares: I know, and some day you might need it. Jeff Richardson: What if I need that app that I haven’t opened since 2009? Adriana Linares: And then imagine the horror if you need it and then you go to download it because you’ve deleted it and you can’t download it because you are in a bad area? Jeff Richardson: Exactly. So like I am looking on my screen right now, I see the Zippo Lighter app. Now, when is the last time I have put a virtual Zippo Lighter on my screen to hold up at a concert? Perhaps never. Adriana Linares: But that’s a nostalgic app. Adriana Linares: You are going to need it. Jeff Richardson: — and that will be important, so I have a lot of apps. So I answer a lot of questions about apps. Adriana Linares: Right, that’s one of my favorite tips. Jeff Richardson: — that can make people be both happy and productive just if so they use it. I like to post on my website just iPhone tips and stuff and sometimes when I post things, I am like, well, you know, is this one, sometimes I post things and I am like, this is a real gem. But sometimes it’s like, this might be a little obvious and then I get like the biggest comments ever of like, oh, I have always wondered how you do that and stuff. So those are the two types of questions that I deal with most of the time. Sort of the tips and tricks on just using the basics, the built-in of things and then the apps to use. Jeff Richardson: It’s under Keyboard. Adriana Linares: It’s under Settings>Keyboard>Shortcuts, I think. Jeff Richardson: Actually you go to Settings, and then I think it’s General, and then under General>Keyboard, and then under Keyboard you have got Text Replacement, that’s four levels. Adriana Linares: All the time. Jeff Richardson: — especially because I have multiple email addresses so I have my Adams and Reese address, I have my iPhone J.D. address, I have a Gmail account that I use basically for like buying stuff on the Internet, so that I can solve the junk email from whatever company they are. And so, what I do is, just with my name beginning with Jeff, I do JJ because never in real life whatever I type two Js next to each other. Adriana Linares: Right, that’s the tip. Jeff Richardson: And so with just those quick key strokes you can make them for whatever you want, but I use that one. Adriana Linares: And whole phrases so if you are constantly ending an email with let me know when you’ve had a chance to look at this, then you create a little Macro, LMG whatever. Adriana Linares: So my other favorite tips in Settings is making the text bigger, but also even bigger going into Accessibility because that makes your options even bigger and I bold my text. Adriana Linares: We are going to talk about that next. Jeff Richardson: — but I have my iPhone set to — I am not sure what the right word for it is. Adriana Linares: And I think it’s Zoom. Jeff Richardson: It’s set on the Zoom function so that it’s the same screen size that you would have a display of the smaller iPhone and I had it set up that way for years so much so that when I see other people that don’t have that setting, it’s like, wow, things are so tiny under iPhone. Adriana Linares: How do you read that, I say to them, and especially like my younger friends who have that below 40 eyes, I go, can you even see that? My watch has bigger font on it than that. Jeff Richardson: Yeah, but then on the other extreme, my grandmother who — bless her soul, is 92-years-old and she has got an iPhone and she is so tech savvy, it’s great. Jeff Richardson: And she has her Accessibility Settings set so large that I think she fits about one word on the screen at a time. But for her that’s great, and I look at her getting a text message, and I am like, you have to scroll to even just see a sentence. Adriana Linares: Right, a sentence. Jeff Richardson: But she loves it and that’s great. Adriana Linares: That’s funny. Let’s come back to apps in a second, but first let’s talk about iPhone sizes, because that must be a question all the time. At this point for me when people ask me I go, you get the biggest one. Jeff Richardson: So you have the Plus, don’t you? Adriana Linares: Right, I have the Plus, which is the big iPhone. You have the normal size, new 6, and then I guess if you have a 5 or lower, it’s smaller than this, right? Jeff Richardson: Plus you can now buy — Apple started selling in the spring of this year the iPhone SE, which is a really nice phone because it’s the size of the 5 and the 5s, which I think was a great phone. But it’s got sort of the muscle inside is like just as fast as the fastest phone, but you can hold it in your hand. For years, I mean I always get the latest iPhone every year, and ever since my first iPhone, I didn’t get the very first iPhone in ’07, because it did not work with corporate e-mailing Exchange. Jeff Richardson: But in 2008, which is when they added Exchange support and when they added app support, so that was like a real big year for the iPhone. That was my first iPhone, the 3G, and then I have had every one since. Adriana Linares: Do you still have them all by the way? Jeff Richardson: Of course, I have them all. Why would you give up your kids? They are very important. So I have all. What I will do with them I don’t know, but they are there. But I used to love the old iPhones that you could hold them so easily in your hand, and I never used cases, when everybody out there had a case, I never had a case. And then when the iPhone 6 came out, I guess almost two years ago now, it was the — Apple made it a little bit bigger once again. It was the first one that because of the combination of the size of it and the fact that it had sort of the slippery edges, the curved edges, it was the first iPhone that I felt I am going to drop this off my hands. Adriana Linares: You could feel like you could hold it better. Jeff Richardson: — maybe I can go back to not using a case and hold it better. Adriana Linares: I love this thing, I know, don’t I look like an idiot? Jeff Richardson: You look like Maxwell Smart holding a shoe up to your face. Adriana Linares: And I have a small face and a giant iPhone. Jeff Richardson: It is, it’s funny. Adriana Linares: But yeah, I agree with you. Jeff Richardson: But I understand the appeal of it because when you’re actually using it, I mean, that’s a beautiful nice large screen. Adriana Linares: Who actually still makes phone calls anymore? Jeff Richardson: Well, that’s the joke, isn’t it? Yeah. Adriana Linares: Right. Like I feel that the last thing I used this for, when it rings I look around I go, what is that noise? Jeff Richardson: Yeah, I feel like if the phone app broke on my phone, I might go weeks without noticing it, because you just don’t talk that much. Adriana Linares: Right. No, me too. So when people ask you which one should I get, what do you tell them? Adriana Linares: Oh yeah, we are going to talk about that. Adriana Linares: In your front pocket. Jeff Richardson: — front pocket, although the Plus fits in a pocket too. The shirt I am wearing now is a little bit larger, but some of my shirts have smaller pockets. It fits nice in there; it still sticks out a little bit at the top, unlike some of the earlier iPhones. Adriana Linares: It’s just not as big and heavy, like if I put this in your pocket, it’s going to weigh you down. Jeff Richardson: This just seems ridiculous. It really seems crazy as I am putting this in my pocket. So, but, I have heard many female attorneys tell me, well, I keep it in my purse anyway, and the 6 Plus is not — the 6s Plus is not so large unless you have the tiniest, the compacts, you can’t put it there, and so they tell me that this is the perfect size for them. Jeff Richardson: Oh, that’s interesting! Adriana Linares: When I am walking around with it. And again, I am not a very big person, so I have probably smaller jean pockets than most people on it fits. Jeff Richardson: And you don’t sit down and just crack your screen, without realizing it’s back there? Adriana Linares: Well, it’s mostly when I am moving around, because if I am sitting down I have it next to me, and I guess the answer is, what do you do mostly with the phone? If you’re actually reading ‘The Wall Street Journal’ on here and maybe having to actually look at documents, and you do it on your iPhone, maybe the bigger one is better. Adriana Linares: But if it’s mostly e-mailing, texting, Pokémon Go, then the smaller one, but I agree it’s a size preference, although I feel that there is no way I could ever go back to the smaller one after I’ve had the bigger one. Jeff Richardson: Yeah, I understand that. Adriana Linares: I totally love this. Well, before we break let’s talk about apps. What are the three or four cannot-live-without or five or six apps for lawyers these days? Is there anything new and crazy going on? Jeff Richardson: Sure. I don’t know about new, because some of the best apps — and I am talking about the iPhone now, not the iPad, had been around for a while. Adriana Linares: Oh it’s crazy. Adriana Linares: Yup. So you are a password manager of choice. Jeff Richardson: Password manager of choice, I use that all the time. Although I do have the built-in calendar on my home screen, the one that I — and I like it, because the Apple built-in calendar app has the date on top of it. Adriana Linares: It has the date, I like that too. Jeff Richardson: But Fantastical has long been my app of choice for my calendar and the listeners, I mean, I know this, it uses the same underlying database so you could enter a date in the built-in app and then go to Fantastical and look at the date, you can change it to Fantastical, go back and forth. Adriana Linares: So I guess the point maybe too though is, again, we probably think people know this but we will mention it. You don’t have to use the default apps that come with iPhone. So there are alternatives in the App Store whose features might be more enhanced. So yeah, I actually use two or three different calendar apps and it’s because I’m lazy. Jeff Richardson: I understand that. Adriana Linares: I like if I want to look at my day, I want to click on one button and it’d go to my day. And then I have a different one that I have defaulted to the week view, and a different one that I have defaulted to a month view, which sounds crazy, but I just want to get there in one tap and then trying to change views. So you like Fantastical, I like WeekCal and then I found a really cool one as a free app the other day called Peek. Jeff Richardson: Peek? I haven’t heard of that one yet. Adriana Linares: And it just lets you really quick peek at your — like here’s today and I tap because it gives me a quick little. All right, it’s so good, calendaring is important. Adriana Linares: I can’t even find a pen or pencil anymore. Jeff Richardson: Right, everything just gets jotted in Notes, which I love, but now with the update, you can also very easily start writing and change something to like a like a bulleted list. So whether it would be like a grocery list or just things that I want to remember to ask a witness in an upcoming deposition. I love it for that, and now you can put multimedia in it and stuff like that. So it’s got all these — it’s really become full-featured. It’s not got so many bells and whistles, I mean, this is the built-in app, obviously there are third-party apps that give you more features, but I have started using Notes so much that literally about three weeks ago I am like, it should be on my home screen and now it’s there, and I am using it even more. Adriana Linares: The home screen is such a funny thing, like it’s a popularity contest for your apps. Okay, what else? Jeff Richardson: Yeah. So other ones that I use, I always wanted to know what the weather is, especially in a place like New Orleans, whether is it going to be hot or is it going to be a little bit less hot or rainy and there are so weather apps I love. Adriana Linares: It’s going to rain. Jeff Richardson: — open up your umbrella in 15 minutes. So I love that app, but the app that I actually have for weather on my home screen is one called Weather Line which I like Weather Line because first of all it incorporates Dark Sky. So you have the same information that rightly rain in an hour and stuff, but as the name implies it has a line. So for example, if one mode has the weather over the hours and I can see that it’s 87 degrees now, it’s going to be up to 90 by 3 p.m., but because there’s sort of a line between the numbers, for me it’s just a visual way to see is it going to be getting hotter, is it going to be getting colder, and likewise, when I switch to the Day View, it’s just a quick way for me to say, oh, it’s going to be getting colder later on this week, or it’s going to be getting more rainy or something. I like the use of the Lines, even though the underlying data is actually the same. Adriana Linares: And it’s $3. Jeff Richardson: Is that what it is? $3? Adriana Linares: Yeah. Maybe I will wait till it comes out as a free app on BGR. What about email? What do you use for email? The native or something else? Jeff Richardson: Yeah, I use the built-in mail app which I find works the best for Microsoft Exchange which was what my firm uses and I also use the built-in app for my iPhone J.D. account which is just a simple iMac account. There are a number of third-party email apps out there and I talk about them from time-to-time on my website and I’m often impressed by their features, but I often have concerns about them and I will give you an example. Jeff Richardson: Microsoft has their Outlook app which they didn’t originally develop, it was another company. Adriana Linares: It was Acompli? Jeff Richardson: Acompli, exactly. And so they bought it and they made it better and it’s a great app and it’s got nice features if you can change what happens when you swipe on things. But in order for it to do its magic, they take the email from your server, including an Exchange Server, and they bring it up to their servers and they do their magic on it and they send it back down to your iPhone, which means that my attorney-client communications instead of only living on Microsoft Exchange Server that my firm controls are now going to a third party. Now, Microsoft itself I am sure has zero interest in reading my emails, and I would trust them to have more security than like a fly-by-night company that just started, but at the same time, it just gives me a little level of pause. Now, having said that, how many attorneys rely upon something like Gmail, which is the same idea? So if you are already comfortable with Gmail, and I don’t mean to imply you shouldn’t be, that’s a personal question, if you are, well, then these apps are fine, but for me, I have just had a number of clients over the years that have been really concerned about security, to the point of pushing us to use TLS for secured emails between our firm. Jeff Richardson: Dual factor, and everything else, the fobs and everything else, and even though that’s only been — it’s not all of my clients, but all you need is one or two that gosh, the last thing I want to do is, what if Microsoft was hacked and the email that I sent my client — it’s just not worth the risk to me for the very small advantages of me being able to say, yeah, but I liked that I could swipe the email to get more action. So that’s just me. I cannot emphasize it enough, I know many people love those and I hear great things about apps like Spark and I love that those apps are out there pushing the envelope, and Apple will typically copy some of the cool features and incorporate them, and that’s great, and then I get to use them. Adriana Linares: Well, I feel like Apple in their either the last rev or the one before that made some enhancements to that mail app that actually make it better. Well, cool. Well, before we move on to our next segment we are going to take a quick break to hear a message from our sponsors. Advertiser: Clio is an invaluable software solution for law firms of all sizes, handling all the demands of your growing practice from a single cloud-based platform. Clio enhances your firm with features such as matter and document management, time tracking, and even billing. Clio is an effortless tool that helps lawyers focus on what they do best, practice law. Learn more at HYPERLINK “http://www.clio.com” clio.com. Advertiser: Ready to create and build your own solo or small firm practice, need a nuts and bolts education on the 360 degree experience of starting a business, there is only one online destination dedicated to helping you achieve your goals, Solo Practice University, the only online educational and professional networking community dedicated to lawyers and law students who want to go into practice for themselves, more than 1,000 classes, 58 faculty and mentors. What are you waiting for, check out HYPERLINK “http://www.solopracticeuniversity.com” solopracticeuniversity.com today. Adriana Linares: Welcome back to New Solo. I am Adriana Linares. I am in New Orleans today and with me today is Jeff Richardson. Jeff Richardson writes a very popular blog, the iPhone J.D. I think he might be known as the iPhone J.D., that’s what I call him. He has a great blog. And Jeff, I don’t know how you find the time, people must ask you all the time, you write really extensive reviews and very helpful posts. Jeff Richardson: I have to admit, many of my reviews are probably longer than other sites, but I always get passionate about what I am looking at. If I am writing about something it’s because I really like it for this reason or it has so much potential and I love this part of it, but let me explain in detail why this little part should be better, and so the next thing you know I have written a million paragraphs, and so that tends to be what I do. But I love that having the website gives me an excuse for playing with technology and seeing the latest stuff, which I would probably do anyway, but now I have an excuse to do it. Adriana Linares: You have a platform and people love it. So let’s talk, in the last segment we talked about the iPhone itself, which is, in my opinion, seriously the most amazing device and thing I have ever held in my hand. It’s gross how much I love my phone; I mean really, I just cannot live without this thing. Jeff Richardson: And I can just point out, before we move on, I have been using these small mobile devices, I am sure you have too, for so many years. When I was in college I used to have like these — Sharp would make these little devices. Adriana Linares: I had a thing called a Newton, was there a Newton? Jeff Richardson: Well, Newton of course, but all these devices and you use them, but they weren’t quite right, and then of course when the Palm came out, that was just amazing, and Graffiti and everything else. But the iPhone, it’s like we are finally there, not that it’s not going to get better in the future, but this is what I have wanted for so many years and I love that we live in an age when we can use it. Adriana Linares: I say that all the time, but I think for as long as I have been in this business, which is 18 years now, every year I think, this is such an awesome time to be in legal technology, but every year just something more amazing comes out, and I am looking at one of those things right now, and that’s that, you have the giant iPad. Jeff Richardson: Right. And much like for the iPhone we talked about, should you get the Plus or the not Plus, and I said that I can understand the bigger screen, but it’s just a little too big for me. It’s the exact same argument for the iPad Pro, and I find it hard to explain why, even though it is a little too big for me, I love the bigger screen, I do. Adriana Linares: So tell me — let’s talk about the different sizes of the iPads because — all right, there is the mini. Jeff Richardson: There is the mini. Adriana Linares: So there is a small, medium and a large. Adriana Linares: Okay. And so, there is the mini, which is what I have here, and then? Jeff Richardson: The 9.7-inch original size has been around since 2010, which is the iPad that people know and love, and it has got a great size. It’s a great compromise between portability and a big screen, so you can really, really see stuff. And then you have the iPad Pro, which when it first came out, the only model of iPad Pro was the 12.9-inch; now there is both a 9.7-inch and a 12.9-inch, so you can no longer call the big one the iPad Pro. I mean the iPad Pro now refers to the professional line of the iPad that comes in two sizes. When you are looking at an 8.5×11 document on the larger iPad Pro with the 12.9-inch screen, it’s full size. Jeff Richardson: So when I use like one of the apps that I love; in fact, I just wrote about it today in my blog, is GoodReader, when I am looking at documents in GoodReader, I happen to have a case and a legal opinion on my screen right now. Adriana Linares: Yeah, look at that, it’s the size of a piece of paper. Jeff Richardson: I mean it’s the same size. So yesterday I was in a deposition and I probably still have all of these documents that were produced by my opponent, and as different documents were coming up and people were referring to them by the Bates number at the bottom, M0143, all of my opponents are opening up all these big binders that they had and I have just got everything right there on my iPad. And if I am having trouble reading something that the plaintiff wrote that’s really small, I just zoom into the screen and I can see it. It’s such a superior way of viewing documents. Adriana Linares: Right, it’s the over 40 eyes. Jeff Richardson: Everything is, like I say, full size, so there is no compromise, and I love it. And then I also love, I have next to me the Apple Pencil, if I am taking notes or annotating or stuff like that, it works so well with this big screen that it’s just like the perfect way to write things. Adriana Linares: And you must have reviews on all this stuff too, so we will just remind people that, we know this is a podcast and they can’t see all the awesomeness, but you have certainly images and reviews on the blog. Jeff Richardson: But let me just say that this big iPad Pro, even though I love it, I will admit, it is not for everyone, because when I carry it around, I mean it really is approaching the size, it is the size of a nice sized laptop, and so you have to make that decision. You will notice, the weight is not horrible, and the weight is less than a laptop, but you will notice it when you are carrying it around, and it does get a little but more in the way. And so I really don’t know that it’s for everyone. Adriana Linares: You lost portability. Jeff Richardson: And then once I got used to it, now you wouldn’t even know that’s the whole lot, pry to my cold dead hands, I would never go back. And my kids, which have my old iPads and they use them for games and school stuff, I pick up one of those and I feel like it’s the mini, and then I pick up a mini and I feel like it’s the iPhone, so it’s crazy, it’s crazy when you get used to it. Adriana Linares: It’s so funny. And you mentioned that you go to court and you go to meetings so you use this in lieu of paper all the time, like this thing. So in order to be able to do that you have got a great app like GoodReader on it that allows you to organize, search for, markup documents. Do you have Word on there? Jeff Richardson: I do, and I love Word on here, I use it all the time. Jeff Richardson: I think in my practice, and I suspect many attorneys’ practices Word is — except for PDF, Word is the format that we all share things in, and I love that I can now open those documents up, edit them natively. I don’t have to worry about messing up the formatting and stuff. I can view them, I can redline them, I can accept redlines, highlight, it’s great. Adriana Linares: I love it. Does it convert to text, on Word, does the Pencil — can you write and it converts it to type text? Jeff Richardson: I don’t think the Pencil does in Word; there are other apps that do that. Adriana Linares: Yeah, there are. I know that there are plenty of other apps, but I wondered in Word specifically if it did it. Jeff Richardson: But Word is nice because Word is great that when you open up a Word document, as soon as you put your Pencil to the screen and you start writing, it instantly recognizes that an Apple Pencil is touching the screen and it instantly switches into the drawing mode, which is really — I mean the Word for iPad app is incredibly well done. Adriana Linares: That’s awesome. I love to hear that. Jeff Richardson: And so you just immediately start annotating things and it works really nicely. I am doing it right now, as soon as you touch the Pencil to the screen you are writing things. Adriana Linares: Right, it looks so smooth and beautiful. Jeff Richardson: So when I will annotate, like I may have a partner or an associate send me a document and I am not in the office, I can look at it on my iPad, and sometimes you want to get into the nitty-gritty and do the redline edits, I just want to sort of rewrite it. But sometimes I just want to like circle a paragraph and say, this is too long, move this up, just the same things that you would do with pen and paper and now you can do it with the Word app and the Apple Pencil, and you send it back to them, just on their computer, it opens up with all of the annotations on it. Now, one concern is that those annotations are picture files, and so it’s not like they are going to edit that version, they need to go back to the other document and make the edits. Adriana Linares: Just like they would have if you had sent them a PDF or a piece of paper through the mail. Jeff Richardson: Just like the old days, a piece of paper, right. But it works really well. And I consider — we talked about essential apps for the iPhone, I consider Word an essential app for both the iPhone and the iPad. On the iPhone, you are not going to write your next great appellate brief, but when someone sends you a document, you can read it, you can revise it quickly. The iPhone in fact has a great feature for Word that — I think it’s called ScreenFlow, it’s at the top-right corner, you hit a button and it reflows the text so that the text is larger. You lose like the formatting of the document so it doesn’t look like what it would look like on the printed page, but you can adjust the text size to make it so legible on the iPhone, it’s great, even on my big iPad screen. Jeff Richardson: I somehow wish they would incorporate that feature here too, so Word is an essential app. Adriana Linares: Good. What about dictation, do you dictate a lot? Jeff Richardson: I don’t dictate long form, not enough that I have thought of using like the Dragon products, but I do dictate short things like email responses all the time. Jeff Richardson: And I use Siri for that, exactly. Adriana Linares: We were joking that this iPhone is so giant against my head that I rarely hold it even to dictate; I have usually got my ear bud and I am talking to Siri and asking her. I think that she is incredible. And actually, I have mine as the Australian mail, so I call him Siro. Jeff Richardson: That’s funny, that’s funny. Adriana Linares: And I think that that’s one the greatest things too is the ability to tell it to send an email, set an appointment, and I dictate a lot. Here is a weird thing I do, I cannot stand typing, and it will often prevent me from sending an email replay because I don’t want to sit there and type out what I know has to be a long response, and many times I will just pick up my iPhone, say it, and then send that to myself and copy and paste it, because it’s so good. And a tip that I learned, which I should mention out loud, and this was like a funny exchange with two different lawyers, when you are dictating and you use dot at the end of a sentence, it does not put a space and cap the next letter. But if you say period, it does. And I was in the car with actually the immediate past President of the Florida Bar a couple of weeks ago and he was dictating and he said period, and I said God, why do you say period, that’s like an extra two syllables. And he said, I don’t know, because that’s how I was trained to dictate. And then he said, proof it for me. So I was looking at it and I realized, because that was one of my complaints was, why doesn’t Siri put a space and cap after I say dot, and I looked at his and I thought — I go, ah, I see. So now it’s a habit for me to have to change to use period instead of dot, because it saves me the — so you are right, it’s all those little tips that you think people are going to know and even advanced users or people who have been using it for a long time just don’t. We are going to be out of time soon, but I do not want to end without talking about the Apple Watch. Jeff Richardson: Oh, I love my Apple Watch so much. Jeff Richardson: I am using it all the time and it works well with Siri, for example, where you hold down the button and you can talk to it about sending a message to my wife or something else, or telling it to do things. Like, I am starting to explore some of the Home Automation, HomeKit. And so, I love that I can just hold down the button and say, set my — I have a TV room that we have like our big TV, and I think I said, set TV light to 20, and it automatically dims the light to the right level. Adriana Linares: Yeah. And are you using Hue at home? Jeff Richardson: I don’t use Hue; I use one called Lutron, where you actually take off the switch off your wall and you replace the switch. Adriana Linares: Better than the Hub. Or does it have a Hub? Jeff Richardson: What I don’t like about the — and I haven’t used it. Adriana Linares: Oh my God, this is a whole another podcast. Jeff Richardson: We can talk about this forever. But with the Hubs, like your light switch has to always be in the on position and then control it, so then if someone else walks in the room and they don’t have all the fancy stuff, whereas with Lutron, you are actually replacing the switch on your wall so that anyone can press the buttons and make the lights go up and down, but I can independently control them. Adriana Linares: Oh, that’s good; that might be my next level. Jeff Richardson: Again, we can have a whole another podcast talking about the Smart Home. I love the Apple Watch for getting notifications and responding to things and getting quick things, and I wrote about this on my blog this week, but last week I had the opportunity to talk to someone who is an Apple developer and they were running the new phone 3 software which comes out this fall. And so I wore their Apple Watch and I was playing around with it, it’s really nice. I mean, the apps are so much faster and I love the Scribble feature that if I want to send a quick response, something that I am not going to bother to take my phone out for, but I want to — what conference room are you in, 46A, if I don’t want to say that out loud, because it’s not always appropriate to speak when you are in a conference room, other attorneys, you can just use Scribble, just 46A, send, and that’s really nice, so I am really looking forward to it. Adriana Linares: I am too. I stayed home a couple of Fridays ago and was looking for something to watch and I watched the Worldwide Developers Conference, and I got so excited. And this was like a nerd fest. Jeff Richardson: This means like you are a real geek, Adriana. Adriana Linares: Yeah. This was a total — by myself on a Friday like listening to them talk about all the amazing things that are coming out, not just with the Mac itself, but with all the devices, but I thought the Watch stuff was very cool, and the iPhone. I mean, I can’t remember now like what I was so excited about to get, but I am really looking forward to the new developments. For me, the Watch is the best for text messaging, and when I am driving with the direction, it buzzes to let you know. Jeff Richardson: Or even walking around. I was in Chicago for TECHSHOW; we were both there earlier this year; obviously you were there since you are going to be running it next year, and I forget where I was even going, but some restaurant and your Watch is just tapping you and saying, turn left. Adriana Linares: Yeah, turn left. Jeff Richardson: And like no one hears it but you. It’s like someone is just sort of whispering in your ear, no one knows that you are getting all this — now you are the master navigator. Oh, I believe we turn left here. I believe we turn right here. And I love that. It’s great. Adriana Linares: I do. I think these tools are just so amazing. And I hope lawyers have really embraced, but continue to embrace the use of all these things. It definitely makes life easier, and for sure more fun. Adriana Linares: And the way you write about things and really help lawyers understand how these things can be used in their business, I think is very, very good. Jeff Richardson: Thank you. Thank you. Adriana Linares: Well, looks like we have reached the end of our program. I want to make sure and ask Jeff to let us know how people can find him on the Internet. So go ahead and remind everybody where to find iPhone J.D. and any other social media that you use. Jeff Richardson: Yeah, sure. The website is HYPERLINK “http://www.iphonejd.com” iphonejd.com, and so I try to post a few times a week, things that I find are interesting, and so if you don’t know about it, you should definitely check it out. There is a link on the side that if you want to click, you can have — Google has a service that whenever I have a post it shows up in your email box early in the morning. So if you just prefer to get stuff in more of a newsletter format. And if you use Twitter, I love Twitter, I don’t post a lot, so I won’t overload your Inbox in Twitter. But I am @jeffrichardson on Twitter, or you can also follow @iphonejd on Twitter, which is a new tweet, whenever there is a new post on the website. Adriana Linares: Excellent. Well great. Well, I have got to go. I am going to hit the streets down in New Orleans. It looks like it started raining. Jeff Richardson: Yeah, we are about to get some rain. Adriana Linares: I am on my scooter so I will have to find — maybe I will find a bar to go sit until it goes by; that won’t be hard to do around here. Well, thanks so much Jeff. I really appreciate all your wisdom and your advice and your enthusiasm for this stuff. For all you listeners who want to learn more about what you have heard today, please visit New Solo at HYPERLINK “http://www.legaltalknetwork.com” legaltalknetwork.com. Don’t forget to follow us on Twitter, Facebook, and subscribe via RSS or iTunes. That brings us to the end of our show. I am Adriana Linares. Thank you for listening and join us next time. Don’t forget, you are not alone, you are New Solo.